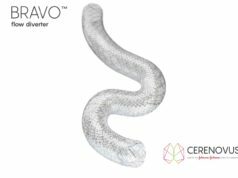 Investigators using the p64 Flow Modulation Device (Phenox) for the treatment of unruptured intracranial aneurysms at six centres have revealed that mid- and long-term follow-up show that endovascular treatment with the p64 Flow Modulation Device is a safe treatment for unruptured cerebral aneurysms, resulting in a high rate of occlusion. This study, published in the Journal of NeuroInterventional Surgery, was designed to define the role of the p64 flow modulation device in the endovascular treatment of cerebral aneurysms. Investigators retrospectively reviewed all cases of cerebral aneurysms that were admitted to six Italian neurointerventional centres between April 2013 and September 2015. Forty patients with 50 cerebral aneurysms treated with the p64 were enrolled in the study. The endpoints were angiographic evidence of complete aneurysm occlusion, recanalisation rate, occlusion of the parent artery, and clinical and radiological evidence of brain ischaemia. The occlusion rate was evaluated according to the O’Kelly-Marotta (OKM) scale for flow diversion based on the degree of filling (A, total filling; B, subtotal filling; C, entry remnant; D, no filling). The p64 was the first and only treatment for 32 aneurysms (64%); in nine (18%) the device was implanted in association with coils due to complex aneurysm morphology and size. Nine aneurysms (18%) previously treated by endovascular coiling (six, 12%), stenting with another flow diverter (one, 2%), or neurosurgical clipping (two, 4%) were retreated with the p64 because of recanalisation. All patients were followed up at three to six months; 34 (85%) were also studied at 12 months and 18 (45%) at 24 months. The authors report that complete occlusion (OKM D) was obtained in 44 out of 50 aneurysms (88%) and partial occlusion (OKM C) in three (6%); three others (6%) had occlusion of the parent artery. Among the three cases of partial occlusion (OKM C), one had an aneurysm of the A1/A2 segment of the ACA and a contralateral hypoplasic A1 which was considered as a functional side branch responsible for the partial occlusion; the two others were large aneurysms of the posterior circulation. Among the three cases of parent artery occlusion, two were intraprocedural (iatrogenic parent vessel rupture in one case and acute in-stent thrombosis in another) and one occurred at three-month follow-up because of interruption of dual antiplatelet therapy. Complete occlusion in 44 aneurysms (88%) occurred at three months in 30 cases (60%), at six months in 11 cases (22%), and at 12 months in three cases (6%). 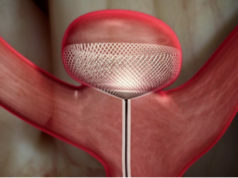 Thirty-eight (96%) of the 40 implanted p64s were patent at the last follow-up. Commenting on the advantages of the p64 device, Francesco Briganti et al state that new flow diverter devices (including the Pipeline Flex (Medtronic), FRED (Microvention), and p64) have met the needs of second generation devices. “In particular, they have been structured to avoid mispositioning of the device and to reduce the associated complications. The main characteristics of these new devices are an improved delivery system with easier and more precise deployment, mesh porosity for maintaining flow in branching vessels, good radio-opacity to confirm apposition to the vessel wall and avoid unwanted thrombus formation,” they write. Summarising, the authors write that this experience with the p64 device shows a similar or even better profile that similar studies with a high occlusion rate (88%), no mortality, and low permanent morbidity (2.5%). They add that further series with a larger patient population and longer follow-up will define the role of this device in the treatment of intracranial aneurysms.